On Monday the Board of Directors at Realty Income (O) announced their 85th increase to the monthly dividend payment. The new monthly dividend rate is $0.199 compared to the $0.1985 which works out to a 0.25% increase. 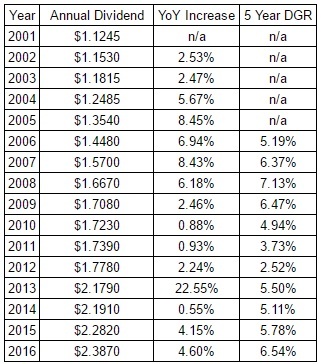 I know that isn't a very big raise but you have to keep in mind that Realty Income has typically given 4 increases throughout the year to steadily increase your income. Compared to 2015's comparable payment of $0.1895 the new dividend is a solid 5.01% raise. Realty Income has increased dividend payments for 23 consecutive years and shares currently yield 3.92%. I own 91.685 shares of Realty Income in my FI Portfolio so this dividend increase grew my forward 12-month dividends by $0.55. Definitely not a ground shaking raise but I'm not one to turn down more money. This is the 4th dividend increase, on annual basis, I've received from Realty Income since initiating a position in late 2013. 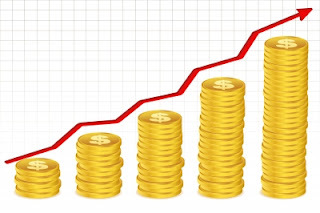 In total dividend payments on my first Realty Income shares have increased 9.62% over that time. According to USInflationCalculator the total inflation for that same time period sits at 1.8% so Realty Income is handily beating inflation with its dividend growth. There doesn't seem to be much value in shares of Realty Income right now as the price continues to march higher. A higher price means a lower starting yield which is down below 4% now. Typically I would look for at starting yield of 4.5% at an absolute minimum for Realty Income and likely over 5%. 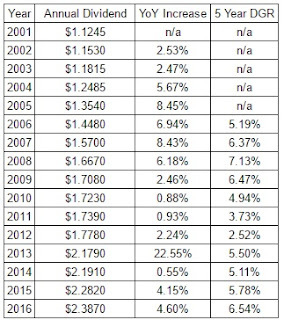 If dividend growth continues in the 3-5% annual rate you'd be looking at total dividend returns around 7-9% which isn't bad but I believe there's better opportunities in the market at this time especially since there's a high likelihood of valuation compression moving forward. My forward dividends increased by $0.55 with me doing nothing. That's right, absolutely nothing to contribute to their operations. Based on my portfolio's current yield of 3.04% this raise is like I invested an extra $18 in capital. Except that I didn't! One of the companies I own just decided to send more cash my way. That's how you can eventually reach the crossover point where your dividends received exceed your expenses. That's DIVIDEND GROWTH INVESTING AT WORK! That's the beauty of the dividend growth investing strategy because you build up your dividends through fresh capital investment as well dividend increases from the companies you own. I've now received 4 dividend increases in March and 13 dividend increases thus far in 2016 adding $63.99 to my forward 12-month dividends. My FI Portfolio's forward-12 month dividends are up to $5,481.58 and including my Loyal3 portfolio's forward dividends of $62.80 brings my total taxable account forward dividends to $5,544.47. Do you own Realty Income in your own dividend growth portfolio? Do like to the see the multiple smaller increases throughout the year or get your raise all in one increase? It wasn't much of an increase but you have to enjoy a raise of any kind. I wish more companies would take the route of smaller, incremental raises throughout the year but as long as they keep coming each year I won't complain too much about the timing of them. I keep saying I'm going to pick up some "Big O" but never do. When will I learn? Well I wouldn't be in that big of a rush to add any to your portfolio right now. Shares have been on a tear and a starting yield less than 4% for one of the largest REITs out there isn't that appealing. It could be a candidate for an options play but given the valuation there might not be too much value in order to get you near a cost basis that would be acceptable. O has been killing it this year. This will be the 3rd increase from them I have realized this year alone when it happens next month. Just an outstanding commitment on their part. My only wish is that I held more than 39 shares. I definitely wish I had bought more shares of O in the past. But man the share price refuses to come down especially over the last 6 months or so. At some point we'll both get an opportunity to add some more to our portfolios but I'm in no rush to add any here. I love that they refer to themselves as the monthly dividend company because it shows you where management stands in regards to the dividend. Their commitment to it will make them even more cautious in acquisitions that they pursue to make sure it's a great deal and from an operational standpoint they're top notch.